Walls aren't the only way to divide your home and create cosy, separate spaces. But if you wouldn't know where to begin with choosing some alternatives, we are here to help! We've been paying attention to what some of the most talented and creative interior designers have been doing, in terms of effective open-plan space division, and we think we've honed in on some of the most fantastic, beautiful and inspired ways to add a little structure to wide open rooms. So if you're keen to embrace your inner interior designer, then check out these ideas and see which ones might work in your home! 1. Use a little nature. 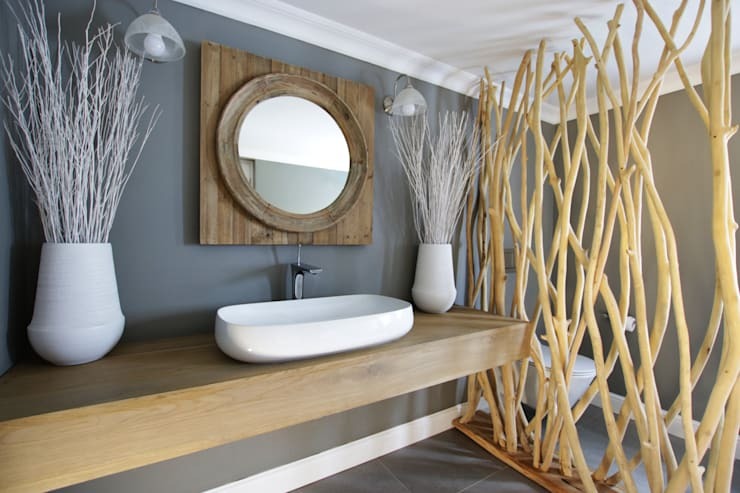 Stripped tree trunks are a fantastic way to add a little privacy, without shutting out any light in your home, especially in small, functional rooms, such as bathrooms. We think this screen looks incredible, especially alongside all the other wooden elements. 2. Try a little art. 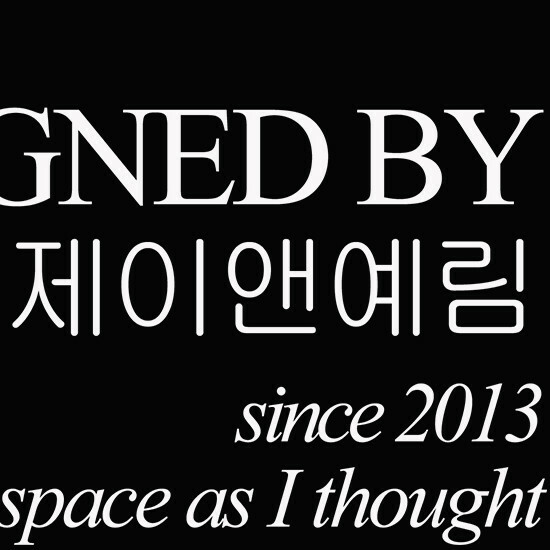 While we are on the wooden screen idea, how about this beautiful idea? Creating an artistic screen is super simple when you use wood, as it is such a malleable material and has a natural propensity for looking contemporary and striking. 3. Glass shelves make perfect sense. Shelving displays are a great way to divide a space, while adding in valuable storage, but instead of choosing a solid installation, why not think about a system that has glass sides? All the light in your home will continue to flow and you'll still be bale to cordon off separate areas. 4. Curtains keep the mood romantic. For a non-permanent and pretty way to divide a space, you can't go wrong with lovely drapes! There when you want a little privacy and easy to tie back when a more open look is what you're after, they are a cheap and easy solution! 5. 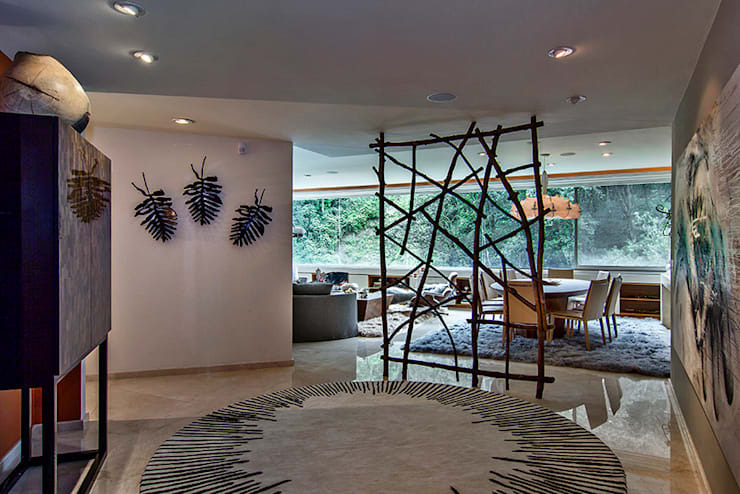 Hanging furniture will be a talking point. Now this really is a different way to break up an open room! 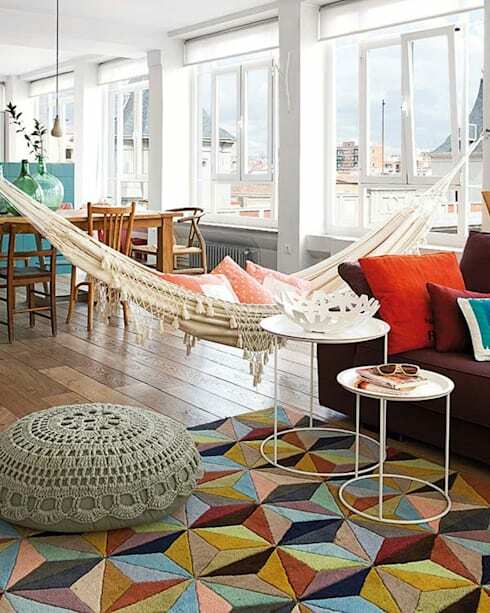 A hammock looks great, adds in extra seating and clearly denotes where the dining area ends and the living room begins. You can even remove it when you don't want it there too! 6. Green walls add some organic beauty. 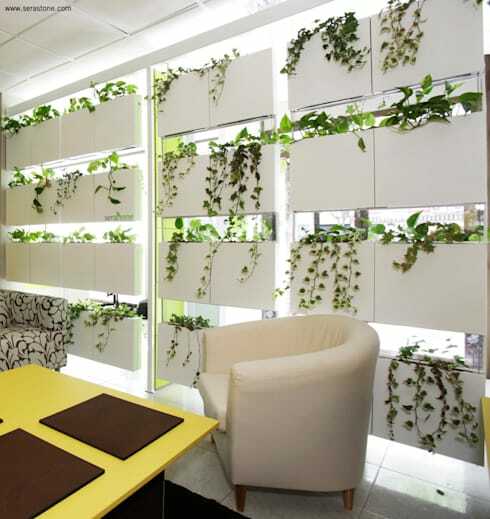 To divide a space without being too heavy-handed, green walls are a truly spectacular way to add style, organic flavour and privacy. The best part of all is that as your chosen plants grow, the display will evolve and develop. Perfect! 7. Try to be really different. When it comes to dividing a space, there really aren't any rules, so how different do you dare be? 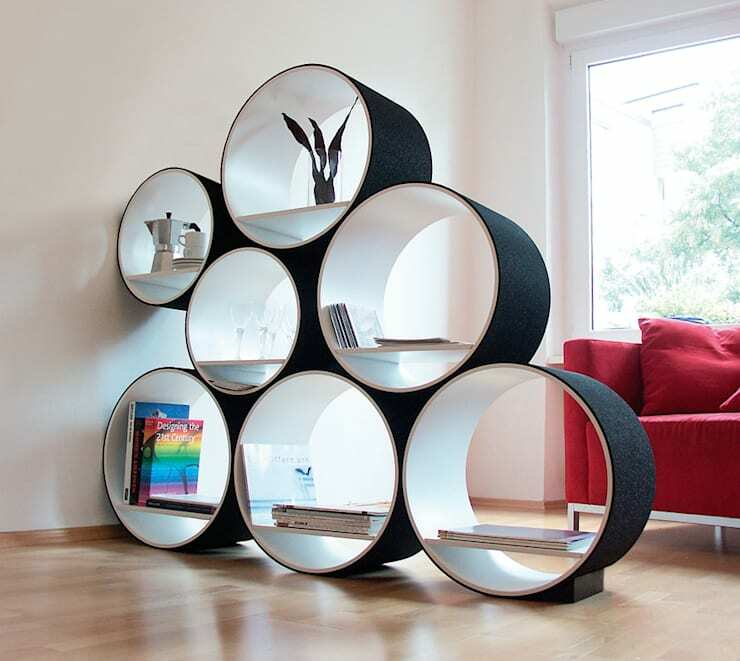 We love these circular displays that offer beautiful aesthetics and extra storage. What an eye-catching way to break up a large room! For some funky wall inspiration, take a look at this Ideabook: 11 wall ideas that have the power to transform your home. 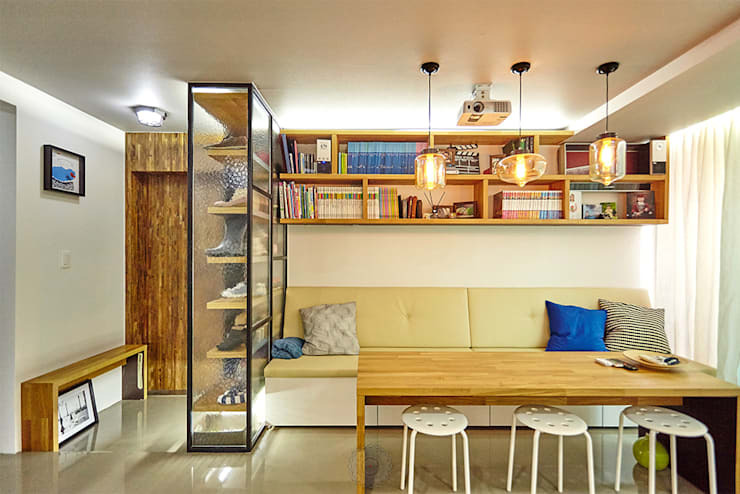 Would any of these ideas suit your home perfectly?